Motley’s Rachel O’ Shea was excited to speak with SARDA Dog Handler, Pauliina Kauppila. SARDA Ireland is a national voluntary 999 / 112 emergency search and rescue organization. Since its establishment in 1987, Search and Rescue Dog Association has been training, assessing and deploying air-scenting search dogs throughout the country. The objective of the organization is to assist in the search and rescue of missing persons. SARDA teams, which consist of a handler and dog, can be deployed in the mountains, woodlands, rural and urban areas, waterways and seashore, as well as in locating accident or disaster victims. Becoming a SARDA Handler is not an easy feat, there are many challenging training assessments that must be undertaken. While most handlers have had previous experience in other search and rescue teams, you need additional training to join the SARDA team. There appear to be many unforeseen and interesting benefits with using search dogs. Motley learned that SARDA’s “dogs are air-scenting dogs which means that they can cover large areas quickly and efficiently. With the right wind conditions, a dog can pick up a person’s scent from several hundreds of metres away. 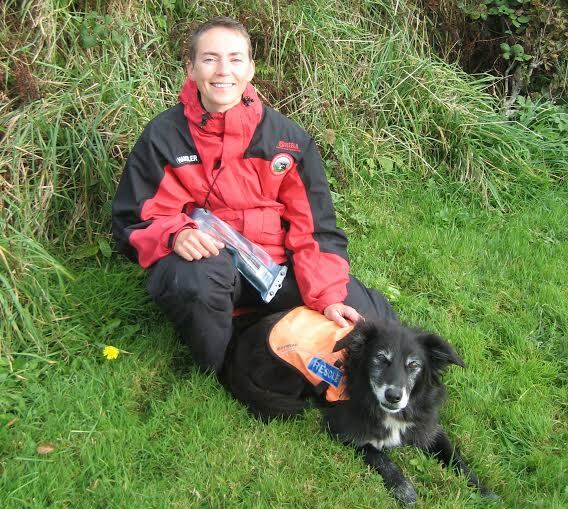 And the great thing about using search dogs is that, unlike humans, they work just as well in the dark or in foggy conditions.” Kauppila highlights the benefit of using search dogs as she recalls a particular case that stood out for her, recalling a time in June when she was called out with her Coast Guard team. When selecting dogs for training there are many factors that need to be taken into account, and not all dogs are suited to the job. “A few different breeds pop up, but most of our dogs are collies or collie crosses,” says Kauppila, “They seem to tick a lot of boxes when it comes to physique, intelligence and play drive. Play drive is hugely important. The more the dog wants to play, the easier it is to train them and the more motivated they are.” Before any dog is accepted for training, it needs to pass a basic obedience test and a stock test. The latter is very important because dogs often train on mountains where there are sheep. The actual search training starts with short run-outs where the dog gets rewarded for finding a person. From this you move on to indication: the dog needs to return to the handler and indicate by barking that they’ve found someone. Gradually you make the areas bigger and the distances longer. The reward is generally just playtime with a tennis ball or a tug toy. “I am always amazed how absolutely motivated my dog is to run around hills for hours, just to get the toy again. You also use praise and general excitement: basically having a find is always a big party! The idea is to make the whole experience as rewarding as possible for the dogs.”Despite the fun of training, it’s quite a long process to get a dog fully qualified,generally it will take at least 2-3 years to get a dog (and the handler!) to assessment level and there is no definite lifespan for a search dog. Being part of the SARDA team takes a lot of hard work but is thoroughly fulfilling and rewarding. Not only are they committed the great work they do helping others but for the love and satisfaction of working alongside you furry best friend. For more information you can visit www.sardaireland.com or on the Facebook page: Search and Rescue Dog Association (Ireland).